Graffiti which was daubed on property in Hadston has sparked a fierce backlash, with yobs being warned that this behaviour will not be tolerated. The village was left in shock after parts of The Precinct were defaced by vandals over the weekend. Whoever is responsible has been branded senseless and CCTV is being checked in a bid to catch the culprits. 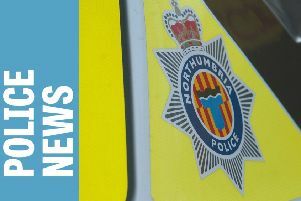 Speaking at Monday night’s East Chevington Parish Council meeting, Coun Scott Dickinson criticised the perpetrators and told members that plans were being put in place for its removal. He said: “It is a lot of years since we have had anything like this, but we are sending out a clear message that this won’t be tolerated and we are looking at the parish council’s CCTV now. “It has come to light that it is a local issue and it is being dealt with. “I worry about the length of time it would take Thrower Stone (Precinct site owners) to remove it, so I have arranged for the council lads to remove it and then bill Thrower Stone for the removal, because it is their property after all. On his Facebook page, Coun Dickinson said he was appalled. It prompted a host of comments.